Spendwise Moms: Is Couponing Worth It? One of the many types of clutter is coupon clutter. Think of all those coupon inserts and the time spent cutting and the extra space it takes to store the hoard of great deals. Is it really worth it? I think we all look in awe at some of the Extreme Couponers who can get 100 bottles of Gatorade for free. Think of the money they saved! But, wait, did they really save money? Who buys 100 bottles of Gatorade? Who would want to drink all that dye? If I drink water and spend no money for it, I am healthier, save time and save the space of having to store 100 bottles of Gatorade as well as the coupons cluttering up my home. I really haven't saved 100 dollars on the Gatorade because I wouldn't buy it anyway. When you buy things that you don't need or use or want, are you really saving money? Even if you do get all that for free, how does it improve your life? Why not just simplify and drink water and save yourself the hassle? How about buying store bought cookies for only a dollar after the coupon? What a great deal! Is it really? I make homemade cookies that taste better for the same amount of money. No coupons, no processed food, no artificial ingredients, no GMO flour, etc. Why would I want to spend the time cutting coupons for things that are bad for us even if they are at a reduced price? Most of the time, I can make it for less. I know what is in the food I make and I can choose pure cane sugar and non-GMO flour, real butter, etc. There really is more to life than a good deal. I speak from experience. I tried couponing for a couple of years. I got a lot of good deals. But, I ended up donating most of it to the food bank. Donating is good, but I don't want to have all that clutter and spend all that time just to give it away. I can do other kinds of service for others without all the baggage of clipping, storing the inserts and shopping. There are all sorts of ways to save money. If you don't want to clip coupons, try something else. Instead of cold cereal, try making whole wheat pancakes or eggs or eat oatmeal. They are all healthy options that don't take a lot of time or money. There is less packaging so there is less trash. There is no artificial coloring. There are no harmful preservatives. There is less stuff to haul into your home after a shopping trip. Maybe you can work an extra hour instead of spending the time clipping coupons. 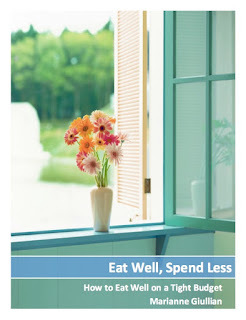 Maybe you can eat less dessert and save money that way and be healthier as well. Don't be penny wise and pound foolish. Your health is more important than a good deal, if it even is one. Still not convinced? Why not go clip 50 coupons for something you don't use or need? Take up space on your shelf storing them. How do you feel? Are you proud of yourself for getting such a good deal? Did you really save money? If you wouldn't buy it in the first place, you really aren't saving money. What if you didn't waste the time and effort clipping and shopping for them? You would have more space in your home for things you do love, more time and wouldn't have to deal with the frustrations of using coupons that don't even work part of the time. There was a woman who used to clip coupons that did an experiment to see if she really did end up saving a lot of money. Her article can be found here. Everyone has to choose what is best for them, but for those of you who feel a bit of guilt for not using coupons, get rid of the guilt. Free up your time and space in your home. Spend your time with your kids and doing things that matter instead of clipping coupons. You will be glad you did. Here in the UK we have far less coupons than in the States and I have watched the Extreme Couponing programmes with a mixture of awe and horror. Just what do they do with all that stuff? So yes, you got five trolley loads of groceries for a dollar but unless the world ends tomorrow how long is it going to take you to eat it all. On the other hand it does strike me that if the Extreme Couponers were willing to put there expertise in the hands of the Food Banks there could be a genuine benefit. The problem is that as far as I can see the coupons only seem to benefit the purchase of rubbish like Gatorade.... so maybe not.